A high-risk pregnancy can be frightening for the mother, but proper care reduces the risk of complications considerably. Dr. Smriti Rana specializes in the treatment of high-risk patients. 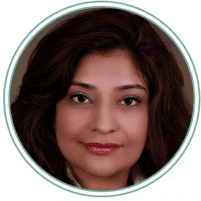 When treating high-risk patients, Dr. Rana always co-manages care with an experienced perinatologist to ensure the best outcome. Patients with high-risk pregnancies in Glendale, Arizona, should contact Blessings OB/GYN and Women’s Care. A high-risk pregnancy is a pregnancy in which the mother or the baby is at a higher risk of developing a health problem or complication. When a pregnancy is high-risk, a greater level of supervision and care from a specialist is usually required. What issues make a pregnancy high risk? What is the purpose of high-risk care? The purpose of high-risk care is to follow the pregnancy carefully so that Dr. Rana can identify any problems as quickly as possible. Depending on the situation, she may prescribe medication to control certain conditions or symptoms. She may also discuss any specific plans or accommodations necessary for the delivery of the baby. If concerns arise, Dr. Rana may recommend certain tests for the mother or the baby. How do patients know if they need high-risk care? Some patients may know that they are high risk before they ever get pregnant. For example, women who are over 35 years old are automatically considered high risk. However, other women may not find out that they’re high risk until well into the pregnancy. Patients who are concerned that they may be high risk should ask Dr. Rana if high-risk care is necessary. How does Dr. Rana handle high-risk pregnancy? Dr. Rana has considerable experience and specializes in treating patients who have high-risk pregnancies. To ensure that patients receive the care they need, Dr. Rana coordinates patient care with experienced perinatologists throughout the pregnancy. What can patients do to take care of themselves during a high-risk pregnancy? The recommendations for patients with high-risk pregnancy are similar to those for every other pregnant patient. Patients should follow all of Dr. Rana’s instructions carefully, as well as any instructions provided by their perinatologist. They also should attend all of their appointments, avoid drugs and alcohol, and get regular exercise.